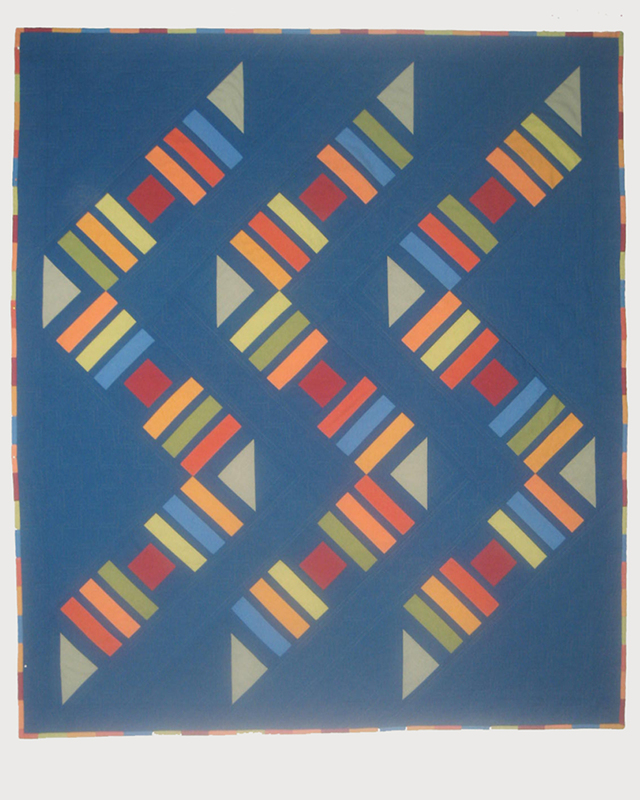 A little known fact about my early quilting years is that more than half my quilts were made from solids and solid fabrics featured prominently in the other 50% of my quilts. I remember my favorite fabric was a beautiful periwinkle color from Gutcheon Patchwork, Inc. And of course I owned every one of Rachel Pellman’s books on Amish quilts. Well, my love for rich, beautiful colors displayed in their simplest form has been rekindled by Jason Yenter’s Modern Solids from In The Beginning Fabrics. They are a chambray weave, with the warp and weft being two slightly different colors, which gives the fabrics an extra depth not achieved by regular solids. And, as I work for In The Beginning during the day (saving my evenings for my pattern business), I am lucky to have had the sample yardage available for me to play with for a while now. And I think I’ve come up with 2 new designs that show them to their best. First is Wiggle Room, a small (41″ x 52″) kids’ quilt, wallhanging or lap quilt, which has a geometric, modern look with a bit of fun added. I used all solids, but I know this would also look great featuring your favorite print as the background. Notice the pieced binding for an extra treat (optional). 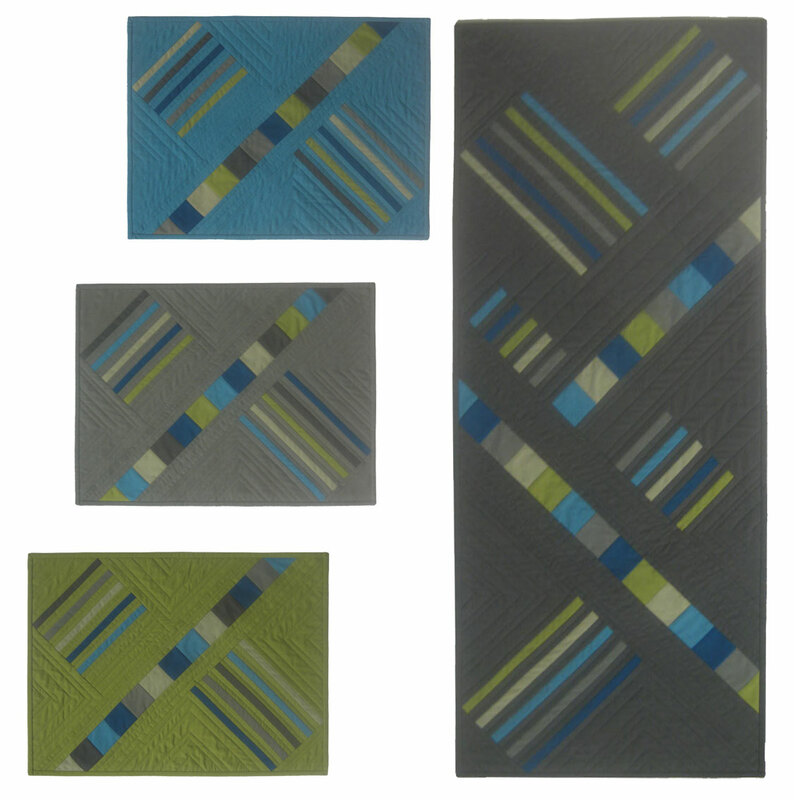 The second pattern, Urban Setting Placemats and Tablerunner, would look good on anyone’s table, whether they have a modern, craftsman, or traditional home. The grays in Jason’s collection are amazing, and, anyone who knows me knows I have a thing for teals and greens! I can picture this set of table toppers in my 26 year old niece’s apartment (she’s a very modern young woman), or on an old oak table under bright Fiesta ware or even white china. 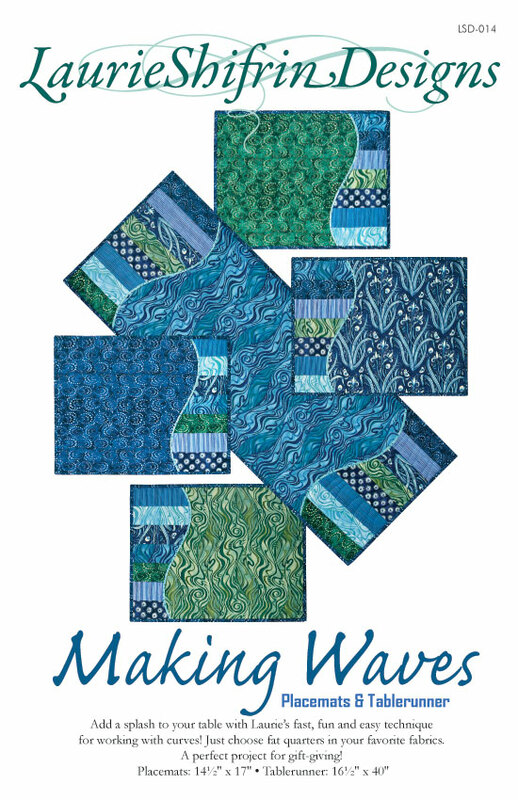 If you’re going to be in Portland, OR, the weekend of May 17-19 for Quilt Market (a wholesale only show), be sure to stop by the In The Beginning booth to check out my quilts. The patterns will be available in July, but I can take advance orders now (wholesale or retail)! 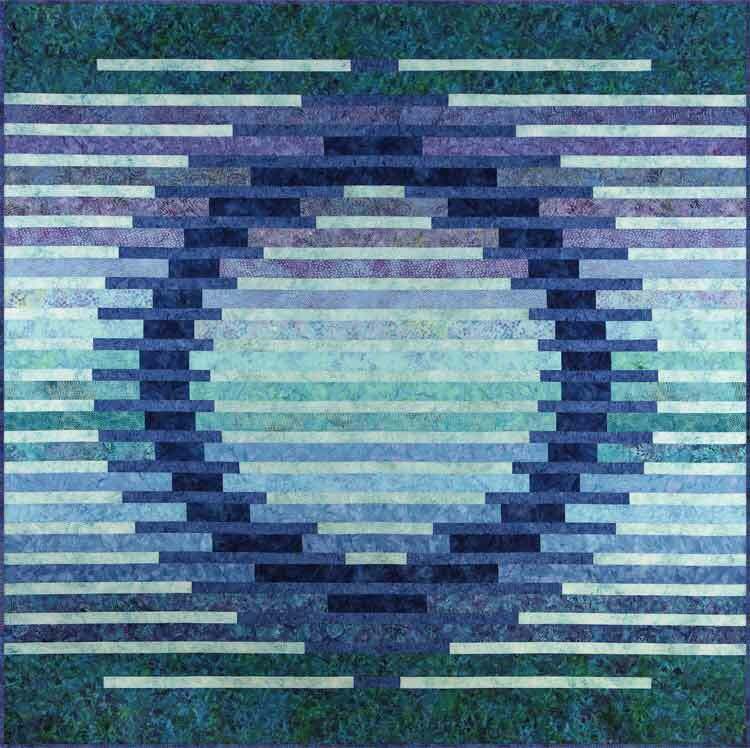 This entry was posted in Laurie's Quilt Designs and tagged chambray, kids quilt, modern quilts, new quilt patterns, placemats, solid cottons, solid fabrics, table toppers, tablerunner, urban quilts. Bookmark the permalink. Thanks Rachel – I think this one is awfully cute too!!! I’m thinking of adding an up-and-down version to the pattern (if I have time). It’s those new solids that got me going on this quilt – I can’t resist a good teal!